How to Find Your (First) Husband is a great fun read that is bound to have you smiling a lot as you read. Isobel married her first husband about 20 years ago and though it didn’t work out, she has always wondered what happened to him and if things could have been different for them. In fact, when things went wrong between them he cursed her and said she’d never find that special someone. Now trying to get her break in television in LA but mostly finding herself dressing up in silly costumes giving out leaflets, she wonders if he was right. Of course, since the wedding took place in the school playground when they were eight, it wasn’t strictly binding! Isobel sees Andrew in the background of a tv news item and becomes determined to find out and see if true love may be on the cards. So begins a journey from LA to England to Tioman, a small Malaysian island. This book and Isobel in particular put me in mind of Bridget Jones. Like Bridget, Isobel seems to get herself into all kinds of silly situations and says completely the wrong things, knowing this herself even as she speaks! It took me a few chapters to get into the story but when Isobel starts her hunt for Andrew, that’s when I really started to enjoy it. From the very beginning of her search as she emails the tv company (lots of times!) to try to find out where the news programme was filmed, you just know this is going to be a funny story. I really enjoyed the second half of the story when she tries to track down (more like stalk!) Andrew in Malaysia. The descriptions of the island made it sound truly beautiful, a real paradise. I didn’t fancy the sound of the food much but the sea, the waterfalls and the secluded coves sounded very inviting. Some of the other characters were great fun to read about as well, notably Isobel’s mum and Moregran. Her mum sounded completely eccentric and so different to her gentle dad. The scenes with her mum were among the funniest in the book for me. I very much liked Isobel’s friend Mel and Mel’s boyfriend Dex who wasn’t directly in the book much but provided a very romantic moment when he did appear near the end. How to Find Your (First) Husband is a really entertaining read and certainly made me smile a lot. There are a lot of feel-good moments in it and you will be wondering just when Isobel is going to realise what she needs to be happy. To the reader, it’s obvious, but the fun of the book is seeing Isobel finally reach the same conclusion. It’s such an enjoyable read that the almost 400 pages just fly by, always a good sign in a book! My thanks to the publishers Corvus for the review copy of this book. 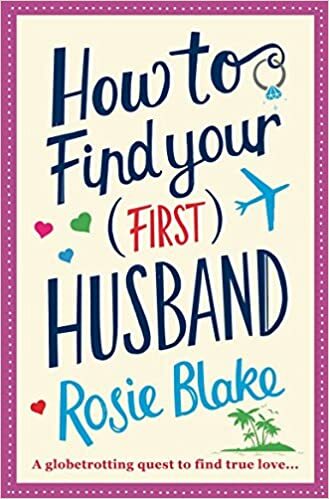 How to Find Your (First) Husband is available now in paperback and as an e-book and you can order a copy here: How To Find Your (First) Husband.